Filled with clever wordplay, sight gags, Dutch words, and dozens of hidden pictures that will keep readers coming back for repeated readings, this is the story of the legendary labor leader, Joe Van der Katt. You may not have heard of Joe because he is best known for improving the plight of blue-collar working cats all over the world. Joe Van der Katt and the other cats from the poor section of Litterbox work for pennies a day in the Cat’s Cradle Company for J. Paul Kitty, one of the Fat Cats who lives on the nice side of town. After not getting paid what they’re due, the cats grow tired of Mr. Kitty’s wrongdoings and go on strike, giving new meaning to a “picket line” in this hilarious fable about Labor Day. Peter J. Welling teaches writing and illustration courses for Indiana University-Purdue University Indianapolis’s Continuing Education Program. He is a father of four and grandfather of three. Mr. Welling was selected as a Distinguished Alumnus for the Liberal Arts and Sciences Division in 2003 by Indiana University at South Bend and is an active member of the Society of Children’s Book Writers and Illustrators. 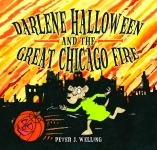 Each of Mr. Welling’s books tell a simple story of both popular and lesser-known holidays and events. 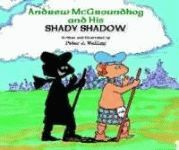 Andrew McGroundhog and His Shady Shadow explains how Groundhog Day came to be through a Scottish groundhog. 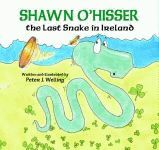 Shawn O’Hisser, the Last Snake in Ireland is a legend of St. Patrick’s Day. 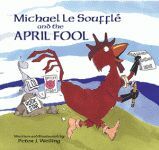 Michael Le Soufflé and the April Fool offers an inventive explanation for April Fools’ Day, involving a French rooster. 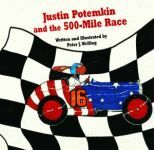 Justin Potemkin and the 500-Mile Race tells about America’s most popular auto race through the eyes of a Russian hare. Click here to view Sample pages. 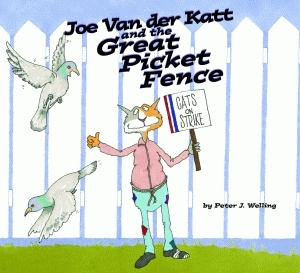 Click here for the Joe Van Der Katt and the Great Picket Fence study guide. WHAT'S UP WITH THIS CHICKEN?